Hatchbacks have always been practical vehicles for buyers looking for an affordable option that provides the same cargo space as a crossover. With sedan qualities, hatchbacks often receive great fuel economy with the interior space that makes this a practical vehicle for a family, commuter, outdoor enthusiast and more. Take a look at this 2017 Volkswagen Golf vs 2017 Toyota Corolla iM comparison to learn more about VW's hatchback option. The Volkswagen Golf family is extensive and there are many options from sporty performance inspired hatchbacks to off-road capable hatchbacks. The classic Golf makes a great addition to the family because of its responsive drive and smooth handling with a spacious interior that is mixed with convenient technology and safety features that make it a safe and reliable vehicle for anyone to own. The 2017 VW Golf is powered by a 1.8-liter turbocharged four-cylinder that produces 170 horsepower. The Toyota Corolla iM is also powered by a 1.8-liter four-cylinder engine but without the turbocharger which leaves drivers with 137 horsepower. With its sporty performance and tight turning circle, the 2017 Golf is great for urban settings due to its precision handling and ability to fit into city parking spaces. 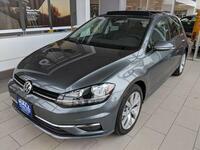 Drivers looking for the best cargo volume in a hatchback will find the Golf exceeds in that category. With 22.8 cubic feet of cargo volume, the Golf offers more interior volume than the 2017 Corolla iM. The 2017 Volkswagen Golf is available in S and Wolfsburg Edition trim levels. For more information on the 2017 Golf please contact us at Hall Volkswagen today to talk with a team member. Schedule a test drive online by checking out our available Golf inventory.